Retails at $79.00 and includes a 60 minute easy to follow DVD. Transform, the way your body looks, feels & performs. 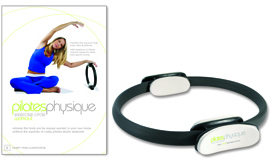 Adds resistance to Pilates matwork classes for faster, more specific toning. Achieve the body you’ve always wanted in your own home without the expense of costly pilates studio sessions! Transform your body in under 3 hours per week! The exercise circle targets problem areas such as the inner and outer thighs, buttocks, upper arms, chest and flattens and tones the abdominals. Not only will the Pilates Physique Exercise Circle reshape and tone your figure, the Exercise Circle workout will greatly enhance both your emotional and physical well being, increasing your energy levels. The Pilates Physique Exercise Circle adds resistance to ensure faster more efficient and effective toning and will sculpt and reshape the body without adding bulk. Build longer leaner muscles and achieve elegant, elongated posture. Purchase the DVD on its own for $24.95 if you already have a Pilates Circle!